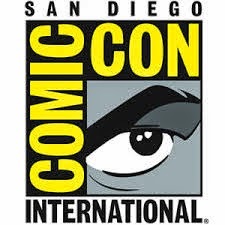 Comic-Con 2013: True Blood Panel – Vampires, Werewolves, Fairies….Oh My! Entering Ballroom 20 first thing in the morning, it’s clear that the majority of the fans nearby are not here for “American Dad”, “The Simpsons” and “Family Guy”. These are vamp-people and they are going to sit in this room all day waiting to see the cast of “True Blood”. The day before I attended a panel at Nerd HQ with Joe Manganiello, who plays Alcide the wolf. Joe handed out stickers with his face, height and weight on them. I used the sticker as a book mark and instantly drew a small crowd of curious wolf-lovers who were unable to see Joe. The number one question was “is he as big as he looks on television” and without hesitation I can honestly say he looks bigger. At Comic Con 2012, most “True Blood” fans I talked to were waiting to see Eric the Vampire (Alexander Skasgard) but this year everyone is talking about Alcide the Wolf. Having recently reviewed the last season of “True Blood” on Blu-ray, my main complaint was that there is just too much going on with this show. The stage is as full as I’ve seen it in Ballroom 20 as the “True Blood” cast enters, and it’s quite an ensemble. Joe Manganiello draws a huge fan reaction as does Rob Kazinsky, who plays Warlow. I’m seated next to an older woman who clearly hasn’t seen the show and is unaware of what show her grandchildren are watching and I kindly stop to explain to her that Rob Kazinksy is not the guy from the office – that would be John Krasinski. Also on stage are Anna Camp and Michael McMillian who play Sarah Newland, and the popular but creepy Reverend Newland. Rutina Wesley (Tara), Sam Trammel (Sam Merlotte), Nelsan Ellis (Lafayette), Kristin Bauer van Straten (Pam), and Deborah Ann Woll (Jessica), Anna Paquin, and Ryan Kwanten (Sookie and Jason Stackhouse) are there, but most notably missing are vampires Eric and Bill (Alexander Skarsgard and Stephen Moyer). Deborah Ann Woll states that she and Kristin Bauer van Straten are missing their daddies (their makers on the show) but no other explanations are given for the absence of the two main vampire leads. None of the questions asked by the moderator are truly interesting or probing. She asks how Nelsan Ellis gets into the character of Lafayette and he explains that Rihanna and makeup help him get to “La La Land” Joe Manganiello is asked about being a werewolf and he states that being a packmaster is a thankless job except for the three ways. No shocking twists and turns for upcoming seasons are revealed and the clip package is more about explaining what has happened than what will happen. The “True Blood” panel was worth the wait, simply to see the cast in person. You didn’t really get much inside information or the chance to feel like you know any more about the actors personally. The fact that I spent an hour with Joe Manganiello at Nerd HQ, made the whole “True Blood” experience better for me. One thing I can say is that they didn’t skimp on the give away. Waiting in line at the redemption center was worth it for the “True Blood” freebies which included a t-shirt, sunglasses and true blood bag. HBO always has really nice looking boxed sets with tons of special features – and they have good giveaways for the lucky ones at comic con. ”Dexter” and Showtime could have taken a lesson from HBO on that aspect.